Yellow gold garnet rings are a great fashion accessory, and a wonderful way to express deep, meaningful love. The garnet, which is a deep red, almost maroon colored gemstone, makes for a lovely holiday gift or birthday gift, since it is the birthstone for the month of January. Whether you are looking for a simple style to wear during the week, or a more extravagant cocktail ring for a holiday party, the selection at Apples of Gold Jewelry is sure to please! Garnets, which come in several cuts, such as round, oval, trillion-cut, cushion-cut, and heart-shaped, look lovely when paired with the soft gold color of a yellow gold band. There are plenty of designs featuring multiple stones and diamonds, or if you prefer a solitaire; those are available as well, and make wonderful engagement rings. Vintage style garnet rings and art deco rings are perfect for adding some flair to an outfit, and the heart shaped cuts, with the deep red hue, are a wonderful choice to say "I love you!" 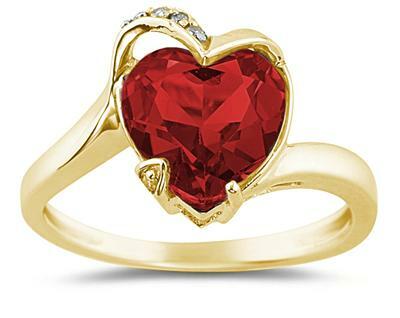 Apples of Gold Jewelry offers authentic garnet rings in original styles, and are priced affordably. All styles of Apples of Gold Jewelry's yellow gold garnet rings are backed by a 45-day return policy.